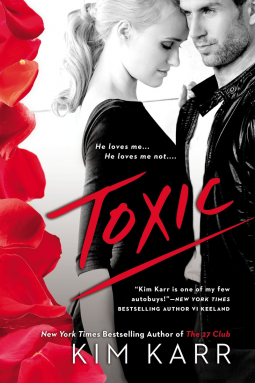 Have you ever been in a toxic relationship? Or has someone close to you had one? I have witnessed it and I think Kim Karr does a wonderful job at describing it. Phoebe St. Claire spent the best summer of her life while staying at the Hamptons. She met Jeremy McQueen during it and they were an item for a while. Phoebe came from money while Jeremy hated anything to do with it. This is the reason Phoebe decided to lie about who she really was. Phoebe and Jeremy fall in love and they make plans for the future, when suddenly the truth is out. Fast forward five years later. Now Phobe is the acting CEO of her family's company, The Saint Corporation. She is in a race to save it when Jeremy walks back into her life. In five years Jeremy has joined the land of the rich. He is now a successful business man. He has everything he wants except for the girl he left behind. Once he sees her again, he knows this is his second chance at happiness. As soon as I started this book, I knew I was going to like it. Phoebe and Jeremy's young love felt real. So did Phoebe's struggle to continue living after Jeremy disappears from her life. Her pain and devastation were palpable. I suffered with her. I could also understand how betrayed Jeremy felt. He did what he thought was best at the time. When he comes back he's more mature and determined to get the girl of his dreams back. Their union is not easy. They both have to fight their insecurities and they have to find a way to forgive each other in order to make it work. This is never easy, especially when some people don't want them together. I was rooting for love to win. I'm hoping Kim decides to write some of the other characters love stories. I was intrigued by Lily, Jamie, Logan and I would like to know more about them. "Love and lust, in equal, healthy doses- now that's all that remains."